Did you think we were being lazy over at Puzzlepart? Think again. This time we give you a status bar top extensions. 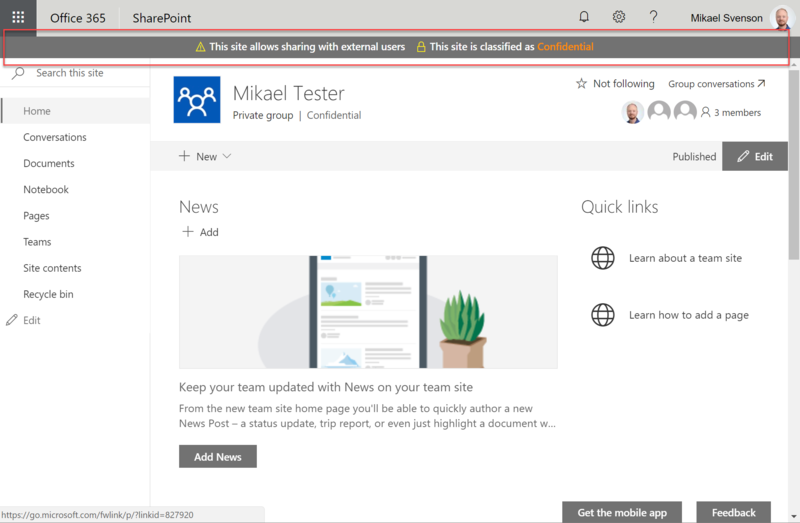 The above image shows two notifications, one which checks if the Office 365 Group support external member or if the site allows sharing with external users. The other highlights a classification setting if it’s a specific value, in this case sites with classification Confidential or above will show a status message. Technically it consists of three extensions, one base extension doing the rendering, and then you can add any number of other extensions which render a message based on the logic you decide. If there are nothing to render, then the status bar will not render. I’m not saying the communication between the parts is the most graceful one, but it’s a pattern we are trying out – and it works, and you can use the base renderer with your own logic. Take a look at the two samples provided and you should figure out how to create your own. The clue is the messageId parameter which has to be the same for all extensions, to make them aware of each other.